Dress. The earliest depictions of dress worn in Ukraine pertain to the Scythian and Sarmatian tribes. Men wore trousers made of woven cloth or fur, jackets, pointed caps, and boots. Women wore a wide shirt extending to the knees, a coat with slits for the arms, and a cap similar to a man's cap but covered with a wrap. The styles of dress worn in the Princely era and the later periods of Ukraine's history were very diverse. The main elements of the dress were the shirt, trousers, cloak, sheepskin vest (kozukh), overcoat (korzno, miatel, luda), cap (klobuk), footcloths, stockings, and boots. The clothes worn by the princes and boyars were influenced by Byzantine fabrics and ornaments. In the Cossack period the nobility dressed according to the prevalent fashion in Europe, in costumes of the Renaissance style, except for certain departures demanded by the severe climate (long overcoats and sheepskin jackets). The Cossack officers and common Cossacks adapted these clothes to military need (short caftan or zhupan, wide trousers or sharavary, and mantle or kyreia). The burghers to some extent imitated the fashions of the nobility and used imported cloth. Changes in peasant dress took place under the influence of Cossack dress, particularly in the Hetman state. Later the nobility adopted European baroque fashions, while the burghers and peasants preserved those features of dress that had been created in the Cossack period. Yet, changes crept in, either in the form of dress (bodice, skirt, man's shirt without ruffles) or in the material (fur coat covered with woolen cloth). With the greater availability of factory-made fabrics in the second half of the 19th century the fabrics from which folk costumes were made changed even more; yet, the general features of folk dress were preserved in the small towns and villages until the First World War. In general, Ukrainian folk dress can be classified into five regional groups. The people of the Middle Dnieper River region, including the Left-Bank and steppe areas, dressed in clothes originating in the Hetmanate period. Women wore wide sleeves, a wraparound skirt (plakhta), a bodice (kersetka), and varied outerwear, including the narrow waistcoat (yupka), coat (svyta), fur coat (kozhushanka), and a complicated headdress (ochipok); men's costumes consisted of shirts of differing cut (chumachka, strilkova) and various outer garments—the coat (svyta), overcoat (chumarka), long, hooded topcoat (kobeniak), and sheepskin coat (kozhukh). In the second region, Polisia, very old features of dress, dating back to the Princely era, have been preserved. There were certain differences between Left-Bank and Right-Bank Polisia and between these regions and Volhynia. 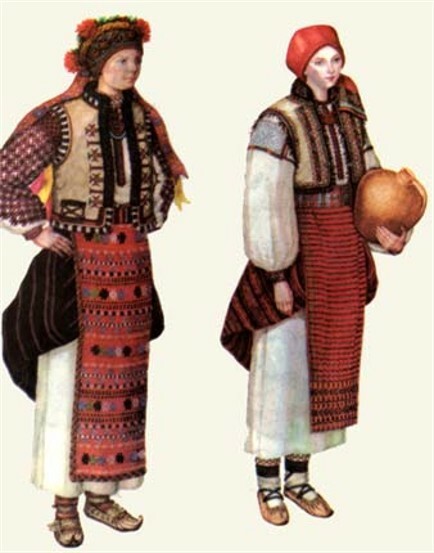 In general, women wore an embroidered blouse with a predominance of red, a colorful woven skirt (spidnytsia, litnyk, andarak), and a white headband (namitka); men wore a shirt outside the trousers, a white or gray coat (svyta), and a high felt hat (iolomok) or gray woolen cap (maherka). 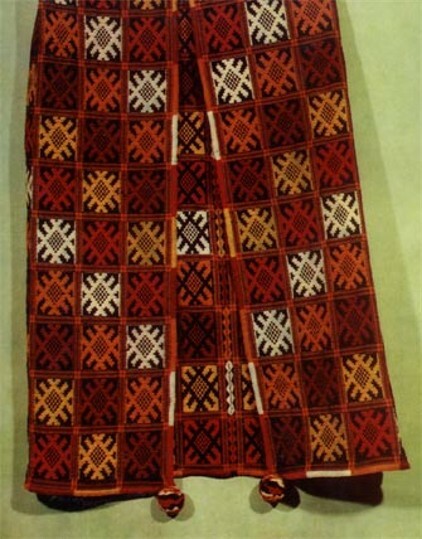 In the third region, Podilia, women wore a multicolored embroidered blouse, a rectangular, woven wraparound skirt (horbatka), and a coat of dark woolen cloth; men wore a mantle (manta-hunka), coat (svytka), short woolen overcoat (opancha), and sheepskin coat (kozhukh). The fourth region, consisting of central Galicia and Volhynia, preserved many old features of dress but also displayed foreign influences. The extensive use of linen in men's and women's outerwear (polotnianka, kabat, leibyk) is distinctive of this region. Women wore corsets and complex, turbanlike head wraps. Men's outer garments were very diverse: jackets (kurtky), caftans (kaftany), woolen overcoats (opanchi), felt overcoats (sukmany), and spencers (spensery). The fifth region encompasses the Carpathian Mountains and Subcarpathia and can be subdivided into four districts—Pokutia and Bukovyna, the Hutsul region, the Boiko region, and the Lemko region. The costumes of Bukovyna and Pokutia are similar to those of Podilia and differ only in the use of the short, sleeveless, sheepskin coat (kyptar) and the tuniclike man's shirt. 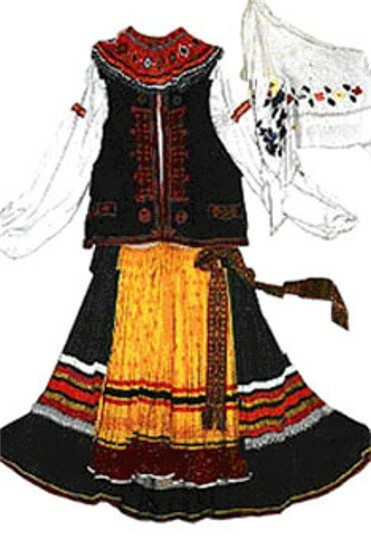 The clothing of the Hutsul area was distinguished by its vivid colors and rich ornaments (picture: Hutsul folk dress). The brassworking craft (necklaces [zgardy], clasps [chepraky]) was most highly developed there. In the Boiko area printed cloth was widely used. Women's skirts were ornamented with pleats and folds. The Lemkos used mostly factory-made cloth. Their characteristic clothes were the felt vest (leibyk) for men and women, the pleated skirt, and the starched, white head wrap (fatselyk) for women. After the First World War urban clothing began to replace folk dress in the countryside because of its low price and the peasant's desire not to appear different from the townsfolk. This first occurred in rural areas close to towns and cities. In the 1930s a certain revival of folk dress became popular in Western Ukraine. Young people in the cities and countryside dressed up for festive occasions in the typical folk costume of the Poltava region or Kyiv region, which was popularized by the Ukrainian theater. At the same time the intelligentsia of Western Ukraine attempted to study and popularize the various regional folk costumes and borrowed folk elements to enrich the style of urban clothing. 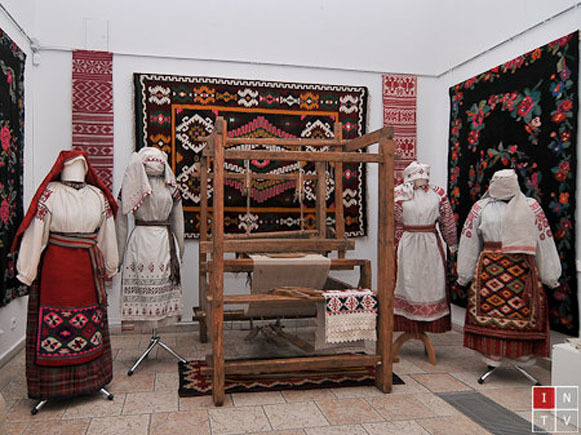 A similar tendency in central and eastern Ukraine led to the daily use of embroidered shirts and blouses and then to the stylization of urban clothing in imitation of folk costumes. Today in Ukraine folk dress is rarely worn, even in the countryside, and is used mainly in stage performances. In a few areas—for example, in the forest belt of the Carpathian Mountains (Hutsul region)—the folk costume is worn only for festive occasions or for dressing the deceased. The rural inhabitants wear factory-made clothes, most often of poor quality. The urban population wears much better, more fashionable clothes. The production of the textile industry and clothing industry is determined by the designs prepared by fashion centers in the oblast cities. Relative to the size of the population and its needs, the number of textile and clothing factories in Ukraine is rather low. Much of the clothing is still sewn to order. The price of clothing relative to wages earned is much higher in the Ukraine than in Western countries. A referral to this page is found in 23 entries.